The 9RX Series 4-Track Tractors will be added to the 9R/9RT Wheel and 2-Track Tractors currently available. During a live webcast on Aug. 25, John Deere announced its 2016 9RX Series Tractors, which include the 9470RX, 9520RX, 9570RX and 9620RX. 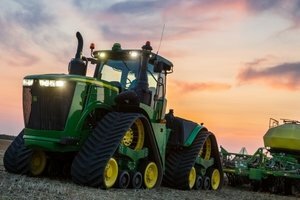 These tractors range from 470 to 620 horsepower, and come with the John Deere PowerTech PSS 13.5L and Cummins QSX engines. The 9RX Series uses a sealed cartridge mid-roller design, which is designed to last about 20 years. Each of the tractors has an undercarriage that features a large diameter 1004-mm drive sprocket, as well as a track tensioning and alignment system. The tractors have positive drive tracks for high horsepower and more efficiency out in the field. They are also puncture-resistant and designed for optimal load-bearing performance. All of the tractors in the 9RX Series are optimally ballasted in the factory. This means that they do not require an additional ballast for high performance. Additionally, each of the machines has a maximum weight of about 62,100 pounds. Those who enjoy John Deere’s CommandView and CommandCenter controls will have these conveniences in any of the 9RX Series Tractors. Efficiency Manager also helps users shift the transmission smoothly throughout the workday. The redesigned hydraulic system on the 9RX Series Tractors ensures that users maintain their holding ability at transport speeds. The ActiveCommand Steering system is designed to allow users to steer with less effort at top speeds. More information on the 2016 9RX Series Tractors can be found on www.Deere.com or by speaking to your local John Deere dealer.